Rishikesh is the ultimate destination for harmony of your mind, body and soul. Located in northern Uttarakhad at the foothills of the Himalayas, Rishikesh is surrounded by hills on three sides and provides a sense of being on top of the world. 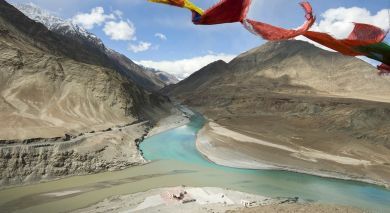 The area is a spiritual pilgrimage destination given that the great River Ganges, considered sacred to the Hindu religion, flows through the town’s hamlets and settlements. Venture to Rishikesh for a healthy and mystical experience, as it is considered the yoga capital of the world. Ananda in the Himalayas aims at harmonizing and rejuvenating the body, mind and soul. Translating to ‘On the banks of the River Ganges', Ganga Kinare is a simple retreat in the heart of Rishikesh along the banks of the Holy River Ganga, overlooking Rajaji National park. Located in Byasi in Upper Rishikesh, Raga on the Ganges is a relaxing wellness resort..52km from Haridwar Railway Station and 57 km from Dehradun Airport. Start your day by visiting the Market – see stalls selling varied items like religious pictures, Om-embossed scarves and t-shirts, steel pots/pans and religious nicknacks. Enroute from Rishikesh towards the Himalayas, pass the impressive Ram Jhula, a suspension bridge above the Ganges and a replica of the Lakshman Jhula, built during the British regime in 1939. Visit a hallowed spot called ‘Vasishta Gufta’ – 2 caves where the Hindu sage and yogi Vasishta practiced spirituality. The highlight of the day is the evening sunset Aarti at Parmarth Niketan Ashram – enjoy and participate in religious singing with Ashram students; get involved with the actual Aarti and delight in the phenomenal sight of lights, the aura, the chanting and a special feel – perfect photo opportunity! Embark on a 3-4hr trek to Neer Gaddu waterfalls – see beautiful scenery, small streams, myriad colored flowers, lush vegetation. A trail with steps facilitating the trek, give rise to the phrase – soft trek. 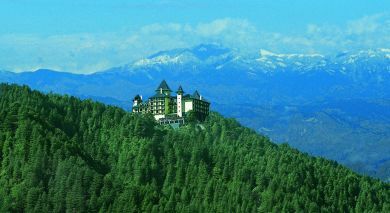 Enjoy spectacular with views from atop of waterfalls on one side and foothills of the Himalayas on the other. Extend 1hr more if wishing to visit the nearby village. Comfortable shoes, a swimsuit and change of clothes, would be ideal if wanting to swim in the pool by the waterfall. Spend a day at Swami Rama Sadhaka Grama (Village of Spiritual Seekers), meaning ‘The Meditation Village dedicated to the teachings of Swami Rama. It is a spiritual retreat center built like a beautiful hill village, set on 8 acres of clipped lawns and lush gardens with an eclectic mix of cosy bungalows, yoga spaces and research labs. SRSG was founded in 2002 by Swami Veda Bharati with the aim to teach the knowledge of Yoga meditation within the Tradition of the Himalayan Masters. It is one of the world-leaders in Dhyana-yoga instruction, as well as scientific research into yogic meditation. Start the day at 0500hrs with prayers followed by yoga, meditation and breathing exercises; breakfast is at 0830hrs; lunch at 1300hrs; tea at 1600hrs; dinners at 1900hrs..all meals are simple vegetarian and at Ashram dining hall; more classes and programs take place between meals. The day ends post dinner..daily schedules may vary and may be customized upon request. Spend a day at the Ashram – Swami Rama Sadhak Gram in Rishikesh town, run by an educated lady with visitors from the world over. The ashram’s day starts at 5am with morning prayers followed by yoga, meditation and breathing exercises. Enjoy simple vegetarian meals at the Ashram dining hall. Breakfast is at 8.30am, Lunch at 1pm and tea at 4pm. More classes, programmes, meditation, yoga etc. continue in-between. Dinner is at 7pm before leaving the ashram. A great way to enjoy the the mountains and villages of Garhwal Himalayas is to trek to Kunjapuri..1645m high, about 20kms from Rishikesh..dotted with villages, brooks, waterfalls and the sacred Kunjapuri temple. Enjoy magnificent views of the Himalayan peaks to the North and Rishikesh, Haridwar and the Doon valley to the South. Observe stunning sunset/sunrise panoramas over the Greater Hiamalayan Peaks and the vast Indo Gangetic plains. En route towards Gangotri about 6kms from Narendra Nagar, the road bifurcates at Hindola Khal, leading to the shrine on a small hill..5kms further. Enjoy authentic Ayurvedic treatments and spa with best Ayurvedic doctors for Himalayan Massages and treatments in Rishikesh. Known as the Gateway to the Garhwal Himalayas due to its location at the foothills of the Himalayas, Rishikesh is fast becoming a popular destination for white-water river rafting in India and the world over. Start your adventure in Shivpuri.. popular for its Shiva temples and Adventure Sports..just 19km from Rishikesh. Work your way along a 16km stretch, muscling through some enjoyable rapids on the Ganges – Initiation, Double Trouble, Hilton and Terminator. In this section of the experience, try some Body Surfing and Cliff Jumping. Continuing further, drift past temples, ashrams and Ghats, while viewing life along the Ganges. Situated along the hills and foothills of Uttarakand’s Shivalik ranges in the Himalayas, 3 sanctuaries – Rajaji, Motichur and Chila – were amalgamated into 1 large protected area..now called the Rajaji National Park. Enjoy a nice 3hr Jeep and Elephant Chilla Safari adventure and Elephant Ride on a 34km Nature Safari trail through the Park..distinct for its pristine scenic beauty and rich bio-diversity, as well as a nature-lovers and wildlife enthusiasts’ haven. Drive along undulating forest on unmetalled treks tracks through ‘Raus’ and hilly terrain via lush green valleys, river beds, dense forests, sprawling grasslands and many never before seen greenery and vegetation. View wild life, birds and flora in different habitats. Enjoy a Yoga session lasting about 1.5hrs, which will include a short introduction followed by a Yoga class incorporating meditation, breathing techniques and various postures/exercises. If wishing to, you may experience Yoga right on the Ganga’s beach. Get an early start for this by waking up early and going to the beach across the bridge in Rishikesh town. Founded by a dedicated American woman with a huge heart, oodles of courage and compelling energy..Dr. Prabhavati Dwabha..Ramana’s Garden Children’s Home/Orphanage is a loving children’s home and school with over 60 ‘at risk’ children..abandoned, destitute or abused..who are given food, shelter, necessities and education. It is also a free English medium school for over 160 students from Ramana’s Garden and local underprivileged families. One need not be an ‘orphan’ to come live here..one has to be at risk of hunger, death, abuse, torture, begging, starvation, total neglect, or being sold into prostitution/child labor. Above all, the children are given plenty of love and nurturing in a warm, tolerant, spiritual environment. Ramana’s Garden works to rescue as many children as possible. 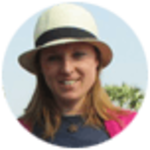 Visit here to see how she works tirelessly to find ways to make the lives of these children sel-sufficient in every way. About 6km from Tapovan is located the Neer Gaddu Waterfalls..with beautiful scenery, small streams, myriad colored flowers and lush vegetation. Take a short Nature Walk along a trail with steps facilitating a light trek..through refreshing waterfalls and a shallow pool; enjoy scenic views from atop..of waterfalls on one side, and the Himalayan foothills on the other. See colorful species of butterflies flit about and simply unwind amid nature’s serenity.